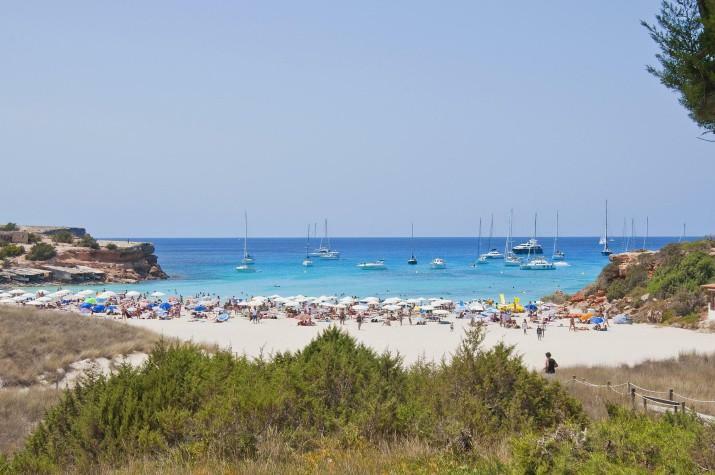 The beach of Cala Saona is situated in the western part of Formentera just a few kilometers from the town San Francesc. Although Formentera has miles and miles of beaches, this one is definitely one of the most popular. Despite its small size ( it is about 150 meters long ), this beach will enchant you with its white sand, crystal clear sea and beautiful pine forest nearby where you can relax during the hot sun on midday. Like this beach, almost every beach of Formentera has the blue flag. As it has all the facilities, perfectly equipped with umbrellas and chairs it is also a great place for families with children. There are restaurant and bars on the beach where you can try some of their great cocktails enjoying one of the most spectacular sunsets on the Mediterranean and the view of the nearby island of Ibiza. We recommend you to visit the beautiful Punta Rasa cliffs from where you can enjoy some amazing panorama and the fishermen’s boathouses which are declared Heritage of Cultural Interest. If you would like to stay near the beach there is the Hotel Cala Saona nearby.